Comfy Curves Table and Stools feature a fresh, fun design. Great for play and reading corners. Gather round, bring your friends! This Wavy Legs Table & 4 stools set is a great addition to any kids reading and waiting area. It includes 1 table( red trim only) and 4 stools. The stools are available in red, blue, green and purple color, be sure to specify the stool colors in the comments when you place your order online. 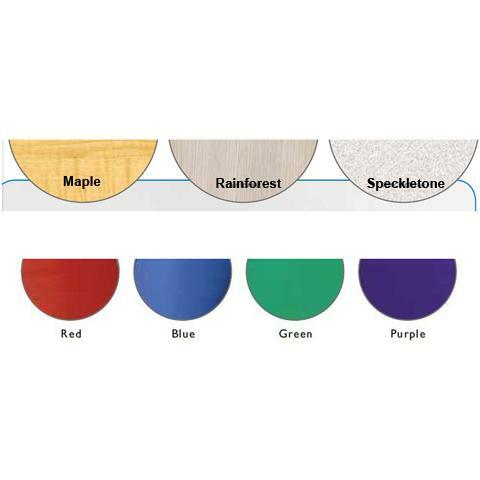 It features speckletone finish and durable maintenance free surfaces. The table is 30"Diameter x 19"H, weight 27lbs and each stool is 11"H x 12"W x12"D, weight 11lbs.